The mother-in-law announces spontaneously and the apartment is not cleaned up. The horror of many housewives and men becomes reality and creates within seconds for stress and a healthy dose of adrenaline. With our tips and tricks for the household, we want to present a structured approach that allows you to quickly and easily ensure that you can receive your guests with a clear conscience, without even a speck of dust on the floor. Make a cleaning plan that leaves no questions unanswered. If you are in a tense cleaning situation, you should definitely set priorities. It does not make sense to clean the whole house, though guests are very likely to just walk down the hallway and then settle down in the living room or dining room. Limit yourself to the rooms your guests will see. But do not forget the bathroom or the guest toilet, because whoever comes for a coffee, is guaranteed to visit the quiet village. In order not to forget something in the hurry or to get bogged down, you should create a to-do list. Here you enter all the rooms you want to clean and sort them by importance. Then write under each room what needs to be done there. Definitely clean only the important rooms. If there is still time left, you can still use them for bedrooms, children’s rooms and a structured tidying up of the kitchen. First, remove any objects that are not in the desired location. These include shoes, clothes, trash, used plates and much more. Pack everything together and distribute it in the room it belongs to. So you have first created the first approach to order and there is nothing left in the way for further work. Just when the sun is shining, you can see the dust in every corner. Especially on smooth and dark surfaces, every crumb falls immediately in the eye. It is an advantage if, for example, you first remove the coarsest crumbs with a hand vacuum cleaner with a fully charged rechargeable battery and then use a feather duster to fine-tune. If all surfaces are cleared of dust, you can move on to the next step. Before cleaning the floor, you should treat all floors of the affected rooms with a vacuum cleaner. Especially if you want to wipe wet, dust, crumbs, and hair must be removed so that there are no stripes or stains later. When cleaning, make sure that you use the right cleaner. For laminate use only special laminate cleaners, which do not attack the surface of the floor covering and provide the desired shine. If you have now thoroughly cleaned the entrance area and the living-dining area, you can take your time for the bathroom. Again, the rule of thumb is: brush from top to bottom. First, wipe off mirrors and surfaces. Then you can take care of the sink and the toilet. If necessary, replenish the scent stone in the toilet bowl. When you have finished the upper works, you can now wipe the floor. Use the hottest possible water here. This kills bacteria and saves you having to wipe everything dry afterward. With the kitchen, you can save time. Put all the food in their place, put the used dishes in the dishwasher and vacuum the surfaces and floor with the vacuum cleaner. Now all you have to do is wipe the surface with a rag. Do not forget the sink, because it is supposed to shine everything. 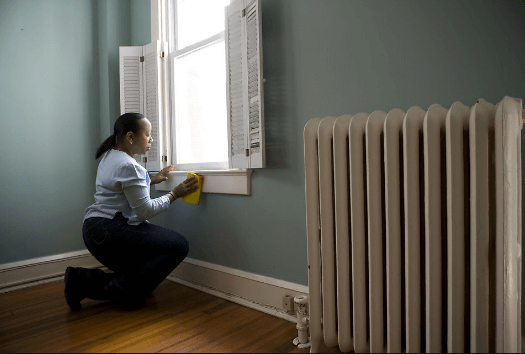 If your windows are regularly cleaned by you, you will not need much time to invest here. Just pick up a glass cleaner and spray the windows well. Then wipe everything off again with a dry cloth in even strokes. Finished. Do you have a garden with fresh flowers and plants? Then make sure you have fresh accents in the apartment after cleaning. Make a vase of flowers, which instantly creates a fresh sense of home. Now that you’ve been drifting through the apartment for an hour or two like a real whirlwind, take a moment to rest and look at your work. The visit can come, and a further advantage has this cleaning action also had: They start fresh and fit into the day because morning exercise has always been healthy for the body. One of the most annoying but unavoidable housework is the wiping of the floors. All sorts of dirt are accumulating here, such as bread crumbs and greasy sauce splashes in the kitchen, slush mud and mud in the hall, long hair and toothpaste stains in the bathroom or lint in the bedroom. With the often tedious removal of the dirt on the ground, unfortunately, can not always be worked with the aggressive chemical club. For sensitive surfaces and for the sake of our health and the environment you should choose alternative methods. But what tips can be observed when wiping the floors? How can you spare yourself time and effort? 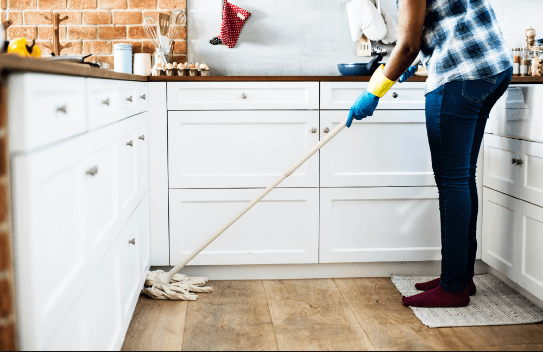 As one of the most important but also simplest tips, it is the right order when wiping the floor in your apartment to be observed. So that you do not constantly have disturbing objects in the way while wiping, you should first clean up. All floor areas to be cleaned must be completely empty. Chairs can be placed on the table. After that, you should definitely first grab your vacuum cleaner. Many people think sucking on smooth surfaces such as laminate or tile is not necessary. However, this removes all loose dirt particles, such as dust, crumbs, and hair, which you otherwise have to laboriously rub out of your cleaning rag. When sweeping with a broom, small stones can quickly lead to fine scratches on sensitive floors. Only then you start with the actual wiping of the soil. Note: wet and never wet! Then stubborn stains should be located and pretreated. 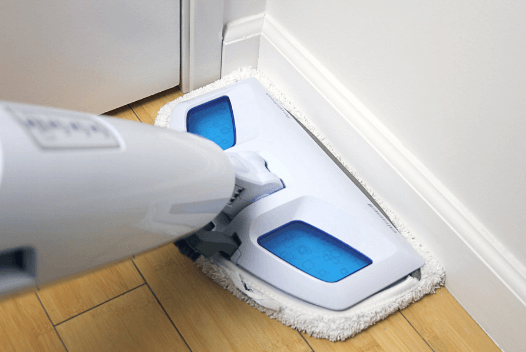 With a damp cloth, the all-purpose cleaner can be placed directly on the dirty areas and left to act for a few minutes. For very stubborn dirt this step should be repeated. The most important rule when wiping is to never use the rag wet but only damp. Especially parquet and laminate do not like wetness as it can swell the sensitive material. Finding the right cleaning rag and device is above all a matter of taste. Rods with joints facilitate wiping in corners and at edges. 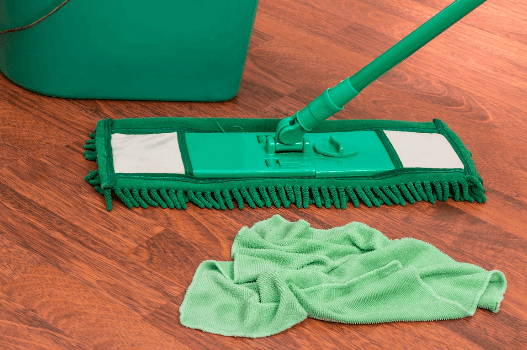 In contrast, a mop is ideal for heavily soiled floors that tolerate more moisture. Very popular are microfibre cloths due to their good dirt absorption and gentle cleaning. Maybe you are always annoyed about stripes after wiping? First of all, you should always work your way from the end of a room to its door to avoid footprints. The choice of the right cleaning agent is crucial. A selection of cleaning products can be ordered online at Allyouneed Fresh. In general, all-purpose cleaners are particularly good. Special care products often contain oil, which leads to unsightly streaks. The better wood floor should be treated regularly separated oil.